Last week was pretty slow for the markets with not much of events taking the main spot. Only the Fed’s meeting minutes were the main event. Policy makers signaled their intention to hike rates at one of the upcoming meetings, but as always, the decision will be data dependent. For the moment, the markets in are in the process of figuring our whether a March rate hike is coming or not. We will know more about this in the week ahead. Besides the FOMC meeting, other important events over the week included the RBA releasing its monetary policy meeting minutes on Tuesday which did not hold much details for market participants. In the UK, the second revised estimates from the ONS showed a surprise increase in the quarterly GDP from 0.6% to 0.7%. However, the yearly GDP data was at only 2.0%, which was slower than the annual GDP growth rate in 2015. On Friday, Canada’s inflation data showed a surprise 0.9% increase on a month over month basis. On a year over year basis, consumer prices were seen rising 2.1% marking the fastest increase since October of 2014. Contributing to the increase in consumer prices was the introduction of a carbon tax in Alberta and a cap-and-trade carbon pricing system in Ontario, both of which came into effect on Jan. 1, as well as higher crude oil price. 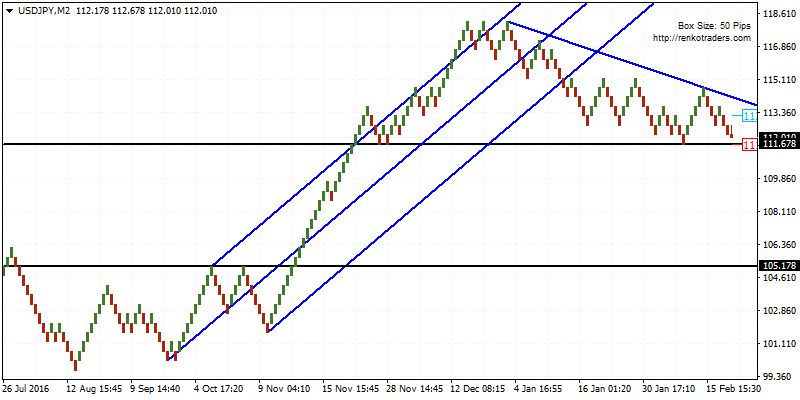 AUDNZD: The AUDNZD chart is based on a 20 pip fixed Renko chart. 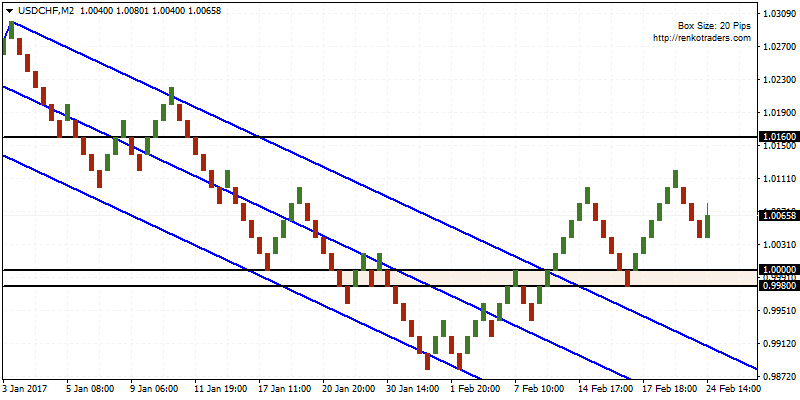 Here, we are expecting to see a near term retracement to the downside near 1.0515. This level was selected as price initially broke out from the falling price channel within the downtrend and posted a sharp reversal to the upside with no meaningful pull back after the breakout. Also, the upside looks to be locked in for now following the test to 1.0733 high. Plotting the Andrews’ Pitchfork we can see price breaking out to the downside, which also validates this view. 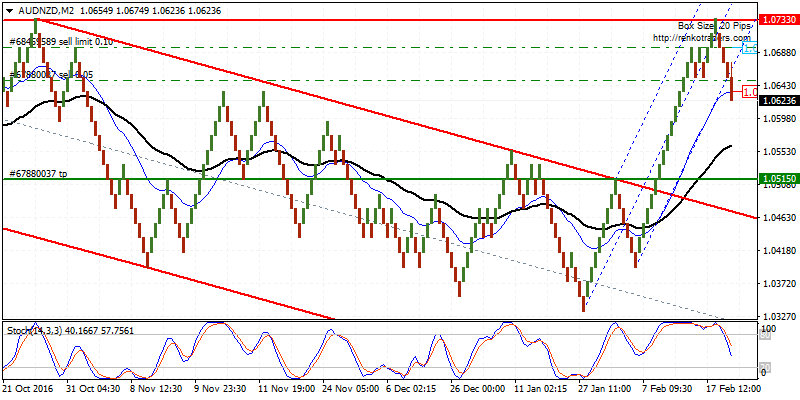 Therefore short positions are recommended targeting 1.0515. 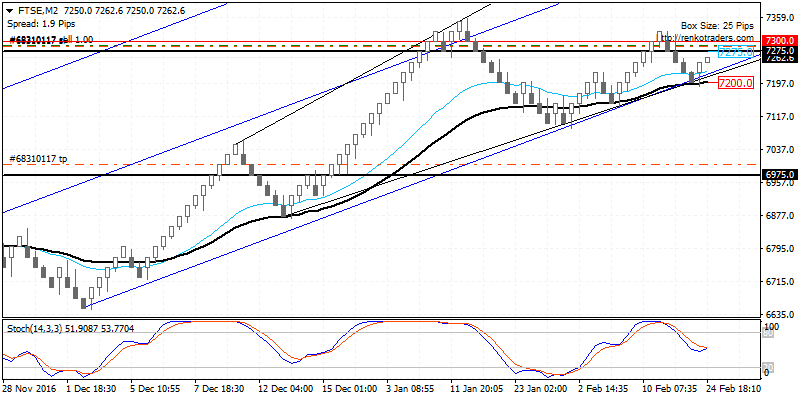 The bearish outlook will be invalidated on a reversal back towards 1.0733. USDCHF: USDCHF is likely to remain biased to the upside in the near term as price will most likely rally to test 1.0160 level. This level could be tested for resistance following the previous break down below as support. A reversal near 1.0160 could mean near term declines back to the current support at 1.0000 and a break down below the support near 0.9980 could mean further declines towards 0.9500. However, in the event if USDCHF breaks out above 1.0160, then we can expect to see further gains push USDCHF towards the above 1.022. USDJPY: USDJPY is trading at a critical support level near 111.678 and a break down below this support could signal further declines to the downside with the next support level seen only at 105.178, this could mean strong declines to come. However, the support level is strong enough to hold back on the declines, in which case USDJPY could be seen rising to the upside but needs to breakout the falling trend line to confirm the upside move in prices. For the near term, it is best to stay on the sidelines and wait for a breakout above the falling trend line for long positions or short positions below 111.678. The week ahead will see the markets transition into a new month. On Tuesday, the U.S. President Donald Trump is scheduled to speak to the U.S. Congress. Traders are hoping that the president will make some mention of the tax reforms or the proposed infrastructure spending. However, last week the Treasury secretary Steven Mnuchin said that it would take as early as August to come up with proposals. Besides the president’s speech, Fed Chair Janet Yellen will be speaking this coming week in Chicago. It will be the Fed’s chair and other FOMC members’ final speeches before the black out period kicks in ahead of the March meeting. So if there are any signs of a rate hike we could get to hear from the Fed Chair this week. From Australia, the quarterly GDP figures will be coming out this week with data expected to show a modest increase in the quarterly GDP at a pace of 0.7%. This will offset the third quarter 2016 GDP from -0.5%. Elsewhere, the Eurozone flash inflation data will be coming out which is expected to show no big changes from January. Most of the data will be focused on the manufacturing PMI from the Eurozone.